New? I have collected the three main tools you can see here over the last four years and they are all pre owned and well used but they are new to me. 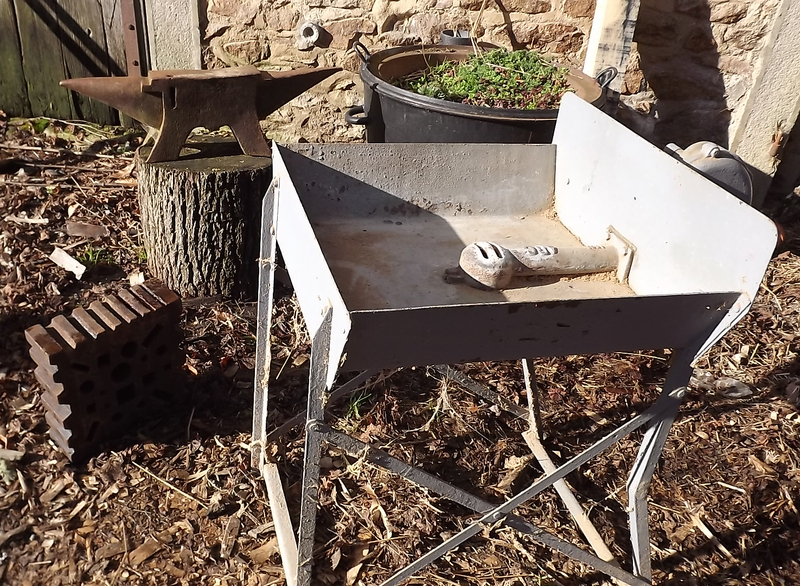 The hearth is a French make with a manually cranked blower, I’m told its a farriers hearth, this came my way for free it was unused in a neighbours workshop. 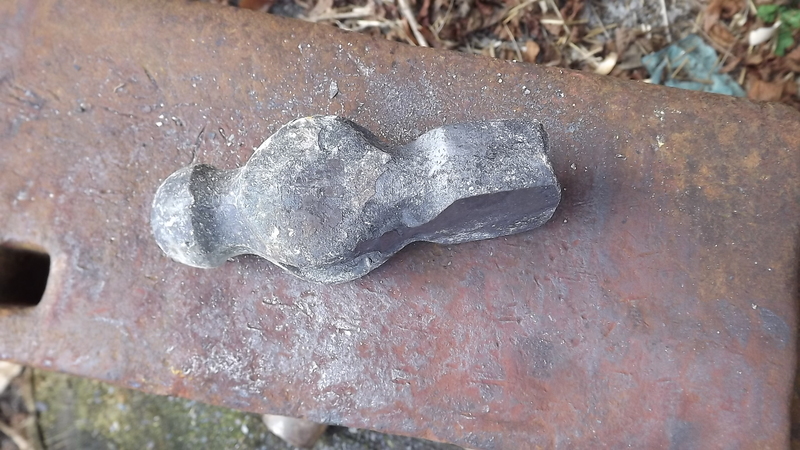 The anvil I purchased through a national French website for for classified adverts, it came from a farm about 10 kilometres away. The swage block I recently purchased from Ebay in the UK and had it bought over by a courier. These and some hand tools I’ve purchased will help me make my own edge tools for woodwork and the home. 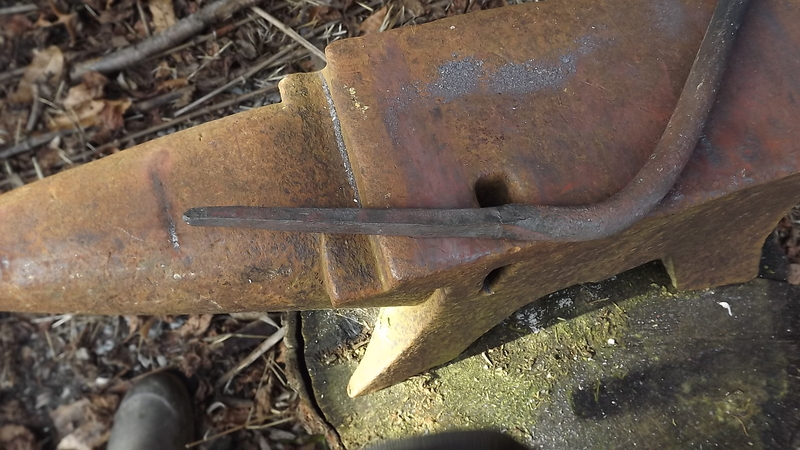 My first project is to take an old very well used auger and give it a new life as a doglegged bowl carving gouge. 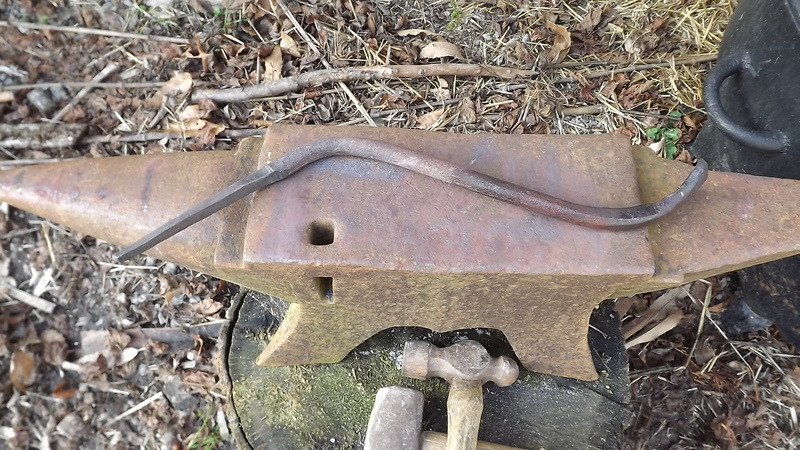 So here is the old tool I’m starting with. The first part to work on is the tang, the part that will be inside the wooden handle of the tool, I will draw out the top of the tool, stretching it out and thinning it to a point. Then I will put a bend in the shaft just before the point the tang thins out. 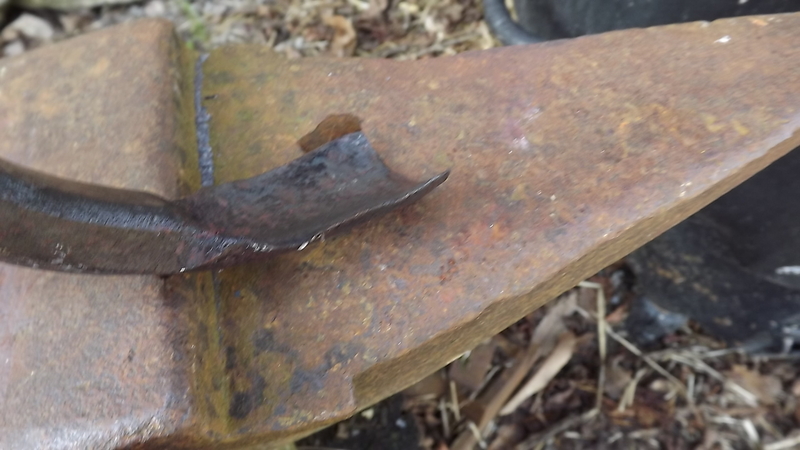 Now to work on the blade, as the tool already has a dished shape some of the work has been done for me but it too long so I will cut off some of the tip and flatten it out a little. Now I have to put the right curved profile in to the end, I will use one of the shaped grooves in the swage block to do this. Then I will put a matching bend in the shaft just behind the gouge blade. This is much bigger than commercially available dogleg gouges but I have a dough bowl which I need this size of tool to complete. 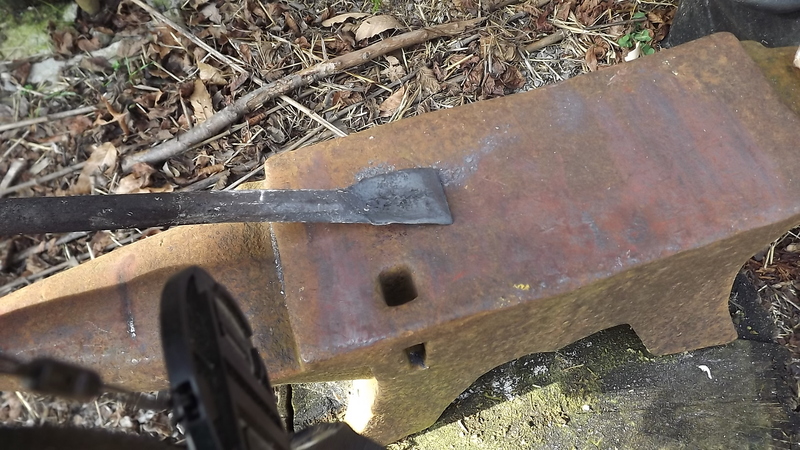 Now the steel needs softening so I can work on it with files, grinders and polishing mops and then heat treating it to harden it so it will hold an edge well. 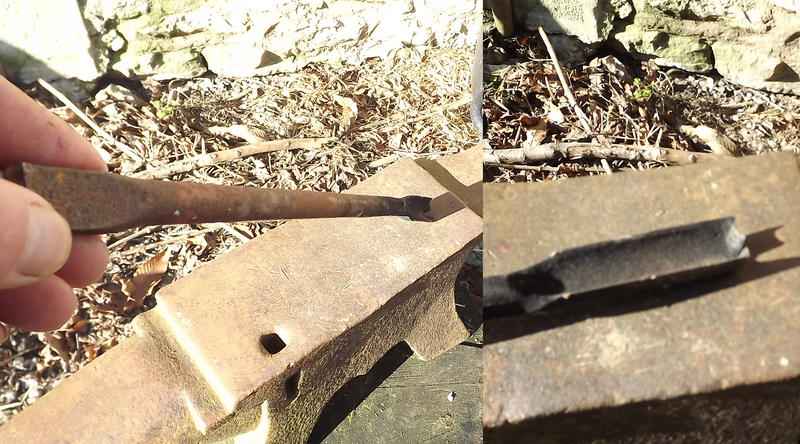 I had some charcoal left so I started some work on an old hammer head I want to make in to an adze, I purchased a few old hammers just for this purpose. 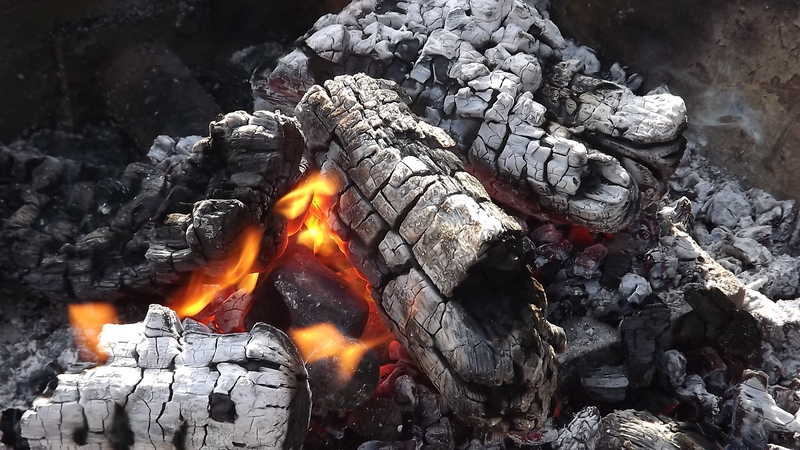 I had trouble getting the head hot enough with this chestnut charcoal, I will buy some coal for the next session but I did manage a red colour after a few minuets of hand cranking and made some progress on the hammer head. Many more posts to come on this subject soon.